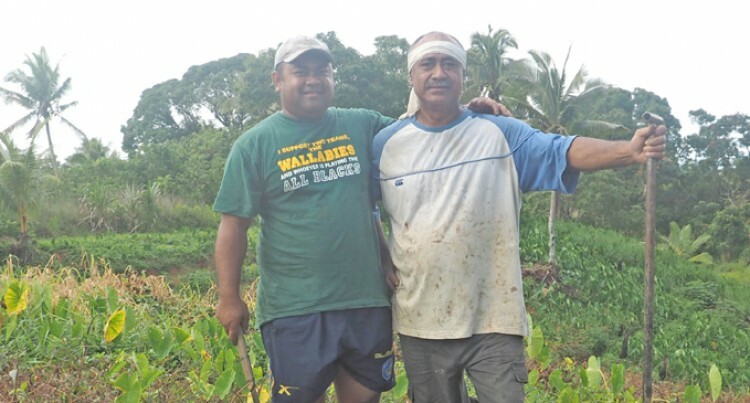 Heavy Lift Company pilot Sevuloni Matetani Dusilele (left) with his father Tevita Dusilele on the family farm at Davuilevu Housing. Photo: Lusiana Tuimaisala. A pilot for Heavy Lift Company in Papua New Guinea spent his one month leave helping his father on their farm at Davuilevu Housing. For his contract with the company, pilot Sevuloni Matetani Dusilele said he worked for one month and off for a month. “When I’m off, I’m still paid by the company and that is part of my contract,” he said. When asked if piloting was different from farming, he said that they were different but to him there was no difference because he loved both. These two works he said were professions and tools used were alot different. As a pilot he said he controlled the flight of his plane operating its directional flight controls. While other members of a flight crew such as flight engineers or navigators are also considered aviators, he said they were not pilots and did not command a flight or aircraft. Aircrews he said were not involved in operating the aircraft’s flight systems (such as flight attendants and mechanics) as well as ground crew were not generally classified as aviators. He said he really enjoyed his one month leave helping his father Tevita Dusilele on his three acre farm. Currently the farm has 25,000 dalo not counting the 5000 that had recently harvested and sold to Ben’s Trading Limited in Navua. He said his father had told him he would change to ginger farming next year. Dusilele has started a ginger plot in preparation for next year. His father also plants vegetables on the farm. He said he was really amazed with the dedication his father but was happy that his markets for dalo and vegetables were fixed. The piece of land is on agriculture lease and his father was able to get it through his mother’s connection to the landowners. One of his brothers Isimeli Loga had just recently retired from the British Army after 16 years. His sister Asena Leba works at the BSP Bank in Suva. According to Mr Matetani they all contributed towards helping their farm on his work on the family farm. Mr Matetani has gone back to Papua New Guinea and has promised his father to return for Christmas.